Seachem's Puigen is a premium synthetic polymer, unlike any other filtration product. It's unique properties remoce soluble and insoluble impurites from the water at an unmatched rate. Purigen controls ammonia, nitrites and nitrates by removing nitrogenous oganic wastes that would otherwise relase harmful compounds. 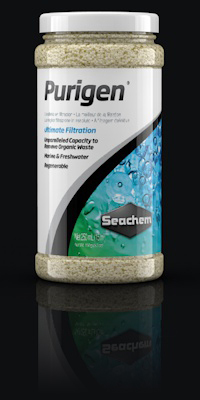 Purigen has minimal impact on trace elements in both slt and freshwater aquariums, while raising the redox potential and polishing the water to unparalleled clarity. Easliy regenerated many times by using a simple bleach solution. The 100ml pre bagged sachet comes ready to use and will successfully treat up to 400L of aquarium water.